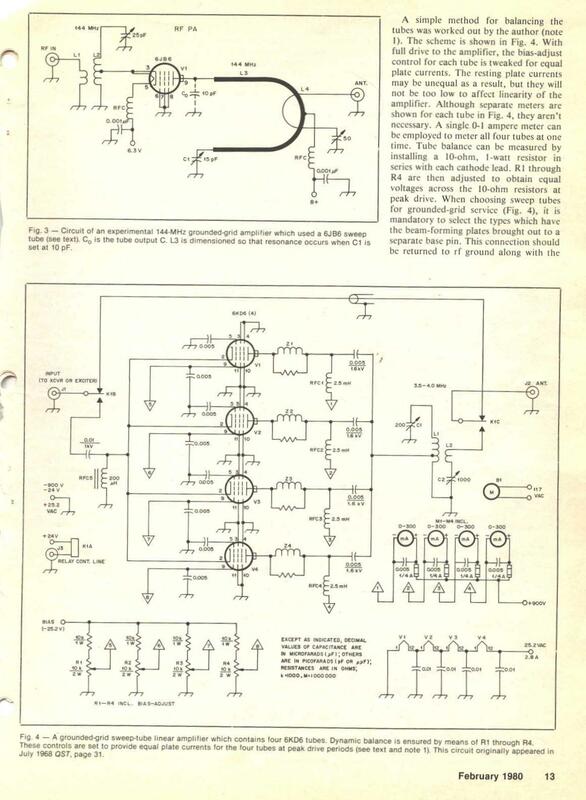 Television line deflection vavles or "Sweep Tubes"
Television line deflection valves or "Sweep Tubes"
Much has been written about television line output driver valves, more commonly known as "Sweep Tubes" and their use in applications other than TV sets. 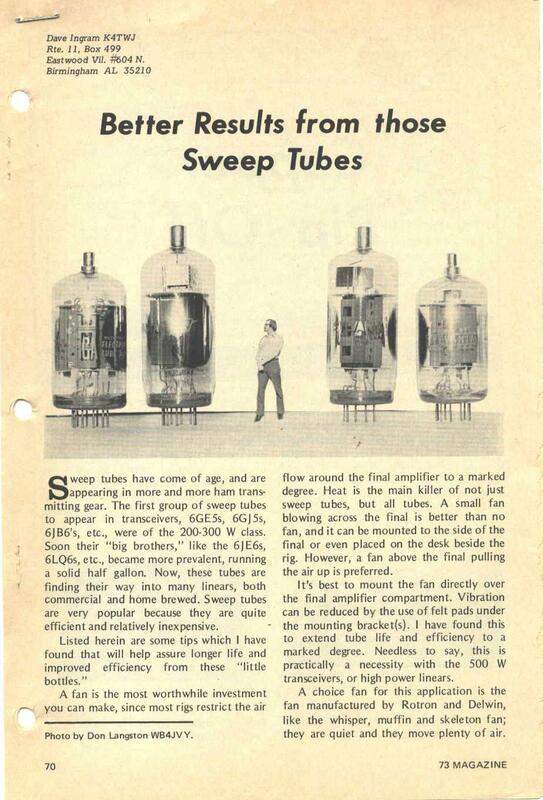 Although with the passing of time these tubes have become less numerous there is still some interest in Ham Radio circles and a lot of sweep tube gear is still in operation. A few sweep tube types are being manufactured today although a few are of variable quality. A number of scanned articles from the 1970/80 period have been forwarded to the webmaster with the idea they be put on the internet. Thanks to Ray W5XE, his XYL and Ron K5BDJ for the scanning these and passing them on. 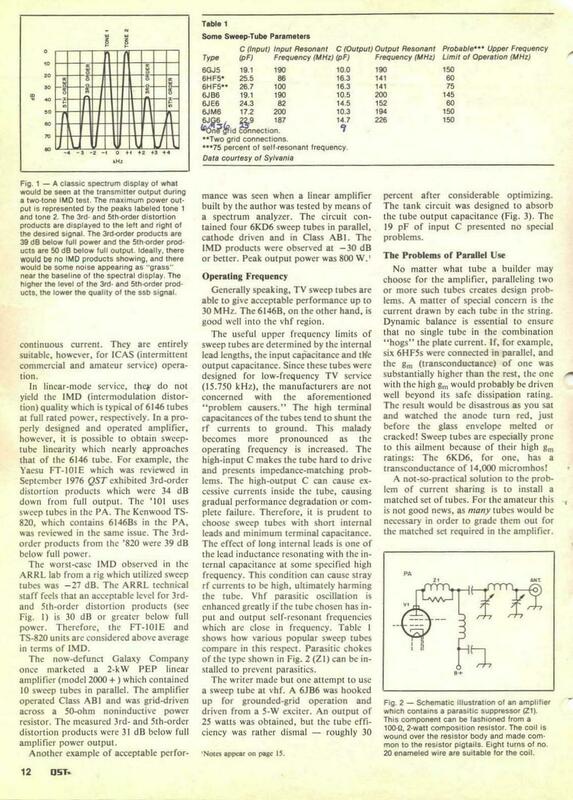 Permission to reproduce these articles here was kindly given by the American Radio Relay League, 73 Magazine and in the later case the author(s) of the original articles as well. You can find the ARRL website here. If you have a fairly fast internet link (or are patient :) you may want to click here to go to a page where all of the articles will be displayed without any further clicks. If you are on a slower link you can display or download each page individually in the section below. Over time I hope to add some supporting text, photos and tube data to this page, please check back again. 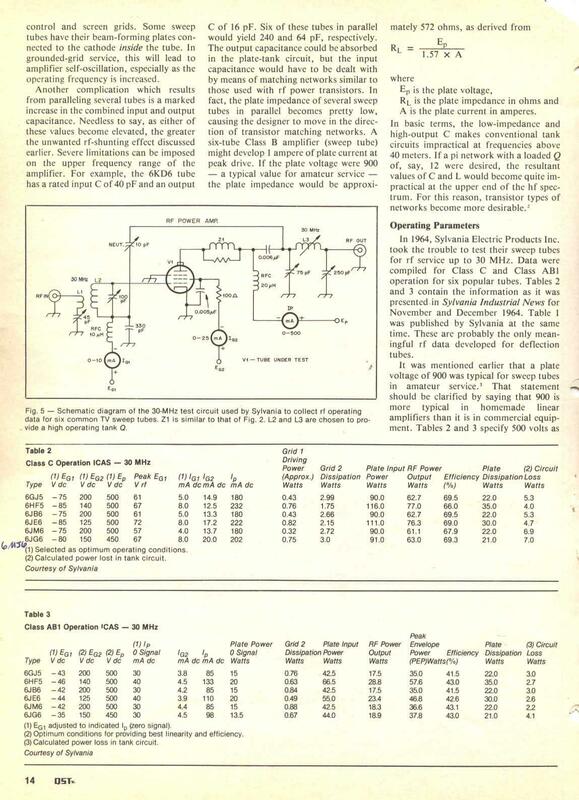 Used with permission from October 1974 QST; copyright ARRL. 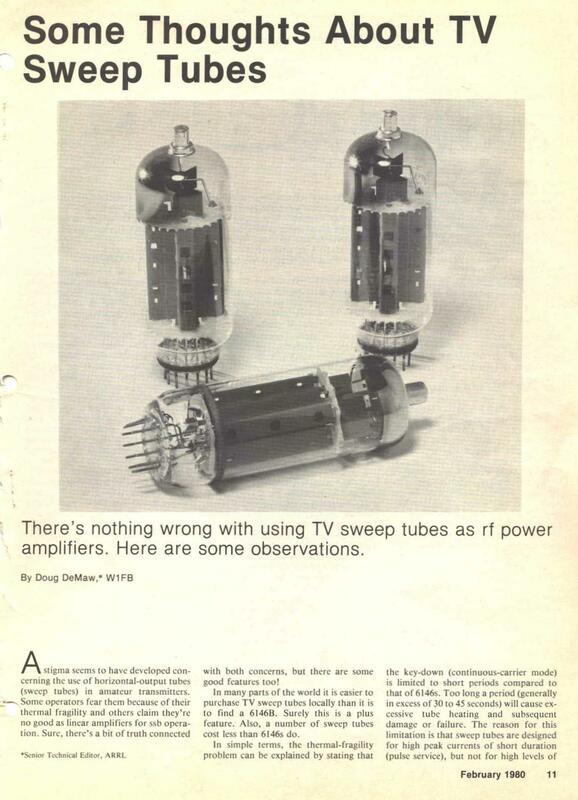 "Some Thoughts About TV Sweep Tubes"
Used with permission from August 1975 73 Magazine; copyright 73 Magazine and the article writer. 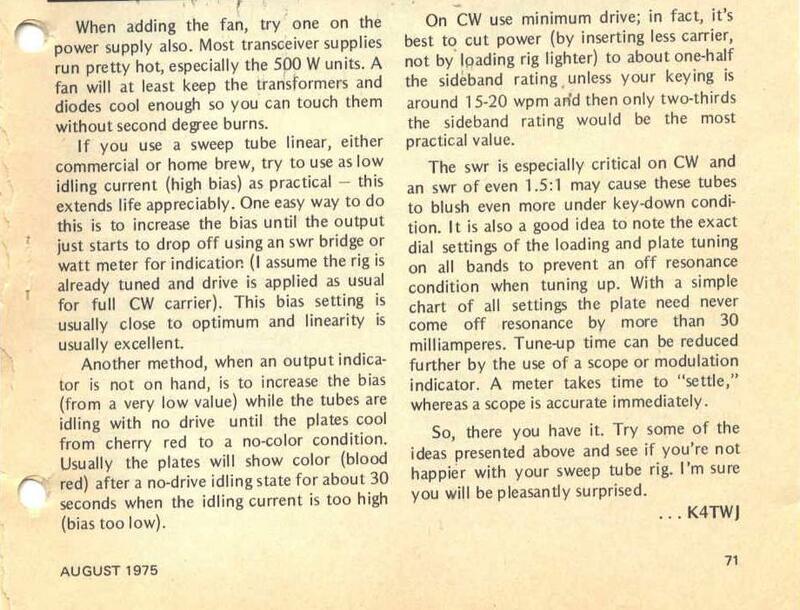 "Better Results From Those Sweep Tubes"
Used with permission from February 1980 QST; copyright ARRL.